This beautiful recipe comes from Amanda. I will never forget her post around Easter time when she talked about family, traditions, childhood memories, the importance of gatherings as a child and inventing new traditions within our own beliefs and lives. This post was such a beautiful narrative of nostalgia; a longing to go back, if only for a moment to revisit the memorable gatherings of our past and relive the sensations we felt. In the past year I have made several of Amanda’s recipes. Notably, her Andalucian cold almond soup (Ajo Blanco), which is silky, cool and just the right dinner on a hot summer evening. I remember blanching and slipping the skins off of the almonds, a very peaceful and meditative task. This is a delicious cold refreshing white gazpacho. We plan on making this soup again soon and this time using home made almond milk. Back to the meatballs. These meatballs are her adaptation of her Grandma’s sweet and tangy meatballs and The Shiksa in the Kitchen, and quite frankly, they are soul food. This recipe is not adapted in any way from What’s Cooking – Fine dining my way. Thank you Amanda. We loved your sweet and sour meatballs. If you are able to preserve any of the juice from your pineapples save it in a separate cup. In a large pot or dutch oven, mix together tomato sauce, cider vinegar, brown sugar, tomato paste, 1/2 tsp salt and the juice from the pineapples. Stir together and turn heat to low to let the sauce slowly warm. Meanwhile, in a mixing bowl use a fork to mix together the ground turkey, egg, matzo meal, paprika, 1/4 tsp salt, garlic, onion, black pepper, coriander seeds, cilantro and cayenne. I like a little heat in the meatballs, so I add a 1/2 tsp of cayenne or sometimes I just use Spanish smoked paprika, which also brings heat, but here it could overwhelm. If you don’t want them spicy, you can omit it completely– or just add a pinch of cayenne for depth of flavor. Form the meat mixture into small 1-inch meatballs. If the mixture seems to moist or stick, add another tablespoon of matzo meal to the mixture. Place the meatballs into the warming sauce. When all the meatballs are formed, bring the mixture to a boil and stir to cover the meatballs with sauce. Lower the heat to a low, even simmer and cover the pot. Let the meatballs cook for 40 minutes, stirring frequently, until the sauce thickens and meatballs cook all the way through. After 40 minutes, add the pineapple chunks to the sauce and stir to coat. Let the chunks warm in the sauce for 5 minutes. Serve hot with cilantro to garnish. This sounds like it’s packed full of flavor! These are so beautiful. I’m so glad you made them and loved them. I really love your recipes and your musings as well. Your comments often make my day. It’s nice to have support from someone who really seems to appreciate what you’re doing. So often I feel like I’m cooking or living in a vacuum and your kind, encouraging words really just resonate with me. I can’t wait to post a recipe of yours! I feel so honored by this post. Thank you, truly. Well, I was nervous about posting them, honestly. I hesitated before clicking “publish”. What if I didn’t do them justice? They were so delicious and I am so glad to have this recipe because it really is something to make over and over. Thank you for all your inspiring posts Amanda! I remember my mom making sweet and sour spareribs when I was a kid and I always thought it was so much work for so little meat on the bones. I really liked using turkey for the meatballs, wonderful. Hey! like your new gravatar photograph! True! Consider making them Allison. They are super! I’ve been seeing some fantastic pineapples at the market lately. Great way of using one. I LOVE them though. This recipe looks like the cadillac of all sweet and sour meatball recipes. LOL! That’s a great story. I know how it is when you just can’t get enough, it’s torture for others around you who don’t share your obsession. I love them too and now I can make them myself! This is a keeper for sure. Thanks to Amanda. Awesome!! Minced chicken will be great. another stunner with the photos. These look goooooood. And you’re so right–a crossover between comfort food and fine dining :-) Fun to see Amanda’s recipes hope over here! I know! I really do make so many recipes from other blogs and don’t post even 1/8th of what I make. I would love to just blog about other bloggers recipes! :) Every now and then one of the recipes hits a spot where I just have to share it (again) with the world! This is one of those, gorgeous! I hadn’t had them in years either! Now I’m going to make them often, we all loved them. We actually do enjoy meatballs often, just with other sauces. And the almond soup is fantastic. I know you get extreme heat in your apartment. Maybe this would be a good one to remember! Thank you! They are delightful. Thank you. :) Perhaps Tenzin’s Beach Bum Berry Counting Stars Tiki Cocktail? I am making veal meatballs tomorrow and was wondering what sauce to make… This might inspire me… Very nice!!! It is very nice. Veal meatballs sound lovely. Oooh, I first had sweet and sour meatballs at a diner in Newton Centre, Mass. I’m not even a meat eater and I loved them! And it’s always a good sign when you don’t change a recipe one bit — it must mean it’s a keeper. Beautiful photos! I love your blog, and Amanda’s, too. Great recipe and prose, as always. Hi Shanna! Nice comment….thank you. Hope you are doing well. What a lovely dish Seana! Can you tell me – did you serve it with bread or something else on the side to mop up the sauce? I’ll be trying this recipe for sure, I think the whole family would really enjoy it. Hi Margot. I served this with a rustic potato loaf. It was fantastic for mopping up the sauce. And believe me, a sauce mop is needed with this because it is delicious. Maybe you could make the potato loaf. I bought mine from a local bakery. It’s a matter of fact, here’s the link because it is interesting to look at their selection of breads. Very inspiring. Very elegant meatballs, beautifully presented. Wow-these look fantastic! Beautiful pictures too. Your friends and family must be so spoiled by your delicious food. Seriously though, your pictures could be in a magazine. 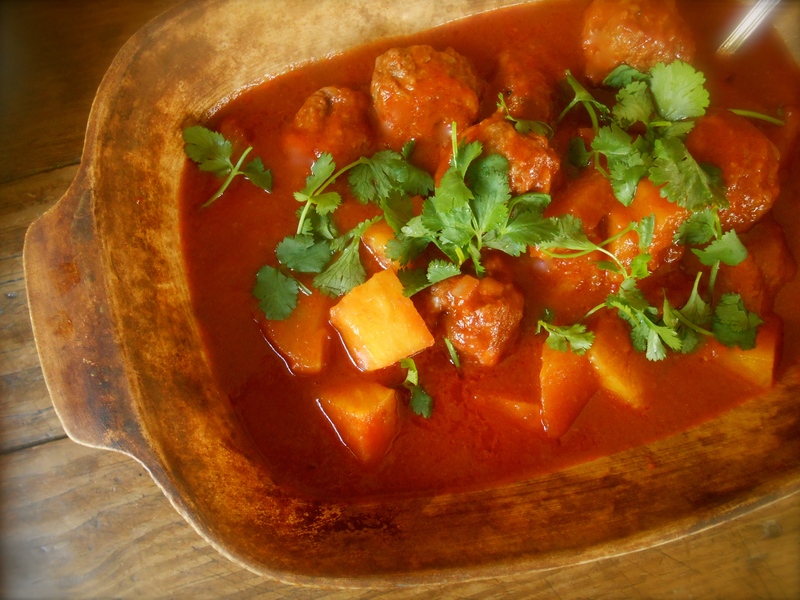 I love sweet and sour turkey meatballs with pineapple. It is sweet with just a tinge of flirty sourness. I’m salivating right now just thinking about it. 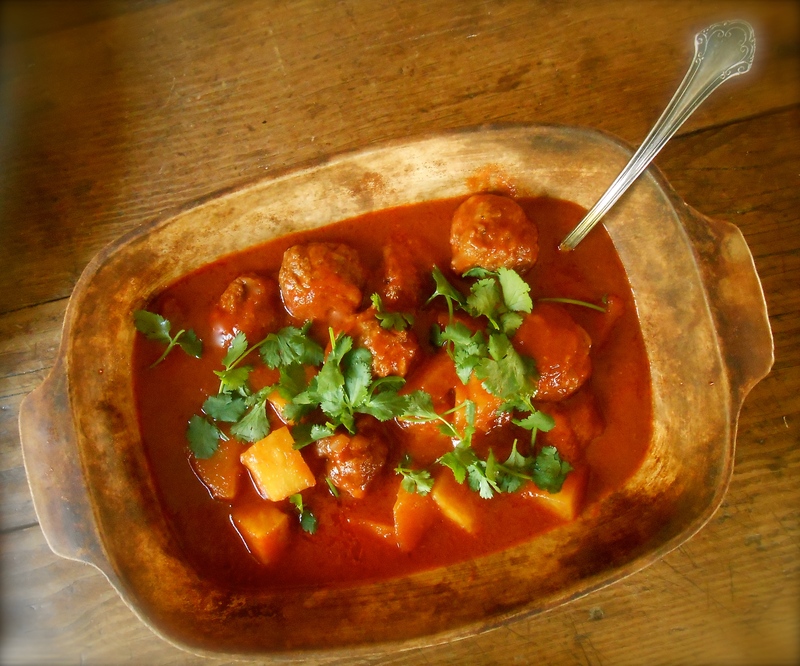 You are currently reading amanda’s sweet & sour meatballs at COTTAGE GROVE HOUSE.